We are manufacturer of Nonwoven Fabric Machine. 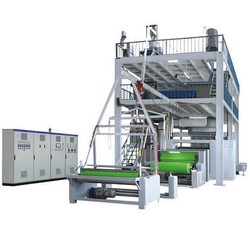 This production line is filament polypropylene fiber spun bounded non-woven fabric equipment. Its raw material is polypropylene (PP), take the principle of spinning man-made fibers, during polymer filature, continuous filament is extended into fiber net, which is finished by mechanical hot pressing. equality distribution of melt, balance pressure. With our vast industrial experience, we have came up with a wide range of Non Woven Fabric Making Machine.